The QuicKomp Artist’s Drawing Tool helps you render drawings with precision and accuracy resulting in works that are in proportion and true-to-life. Isolate a section of the scene in the grid window and visualize your composition in thirds, horizontally or vertically. 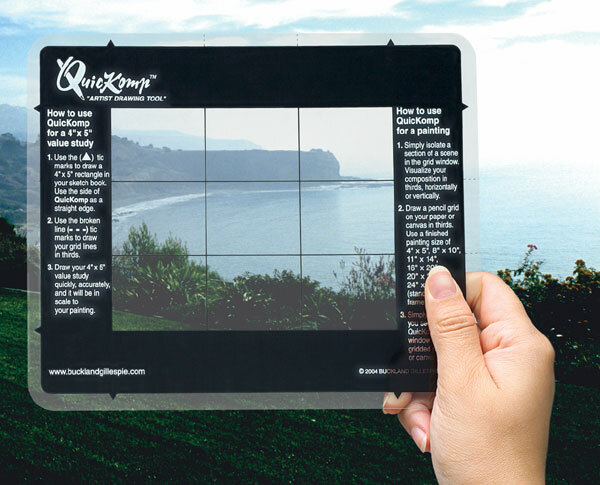 Draw what you see in the QuicKomp grid window onto your gridded paper or canvas. The side of the QuicKomp can also be used as a straight edge. It is made out of a lightweight clear plastic and measures 6½"H × 8"L.
™ QuicKomp is a trademark.